Huawei Honor 3C dual-sim smartphone have all latest features speedy processor with 2 GB RAM, long life battery, dual camera front and rear and all these features are enough for a budget smartphone. 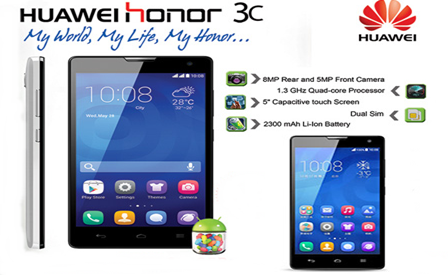 Honor 3C is loaded with Huawei Emotions UI 2.0 latest technology which give you everything on your fingertips it means user can easily manage and access app, games, documents and other important files. Android OS, version 4.2.2-Jelly Bean, 8 GB built-in ROM, 2 GB RAM, microSD card-supports up to 32 GB, 1.3 GHz Quad-Core, Mediatek MT6582, Bluetooth version 4.0 with A2DP, USB, WLAN, GPRS, EDGE, 3G (HSDPA, HSUPA), 5.0 inches screen with 720 x 1280 and IPS LCD capacitive touchscreen, 16 Million colors, Multi-touch, Dual Sim. 8 Mega-Pixel rear camera with 3264 x 2448 pixels features:auto-focus, LED Flash, Geo-tagging, Touch focus, face detection, Video (1080 pixel @ 30 fps) and 5 Mega-Pixel camera find on front side for video recording. GPS+A-GPS, Maps, Games, FM Radio, MMS, SMS Available in two colors Black and White, HTML Browser.